St George Cathedral is located atop the South Boston peninsula at the crest of the hill which runs on E Broadway and near the regional Courthouse between “G” and “H” Sts. Take Interstate Rt 93 south to exit 20, Albany St/Mass Pike. Bear left onto Albany St. At first set of lights take a left onto W Broadway. Proceed over bridge to set of lights at MBTA Station. Bear oblique left and follow W Broadway. At third set of lights bear left up hill onto E Broadway. St George Cathedral is two blocks up on right. Take the Southeast Expressway (Interstate 93 N and Rt 3 N) to Boston, exit 17. Stay in right lane until second set of lights (about 1 mile). Turn right onto W Broadway. Proceed over bridge to set of lights at Broadway MBTA Station. Bear left and follow W Broadway. At third set of lights bear left up hill onto E Broadway. St George Cathedral is two blocks up on the right. Take Massachusetts Turnpike east to Fitzgerald Expressway south (93/3 South Shore). Bear right and follow signs to Albany St/South Boston. At lights turn left onto W Broadway. Proceed over bridge to set of lights at Broadway MBTA Station. Bear left and follow W Broadway. At third set of lights bear left up hill onto E Broadway. St George Cathedral is two blocks up on the right. Take MBTA Red Line towards Quincy. Exit at Broadway Station. Take “Columbia Point” bus and debark at “G” St. St George Cathedral is three doors from the corner on your right. Take Amtrak or bus to South Station. St George Cathedral is a 15 minute walk or a five minute taxi ride. FROM LOGAN AIRPORT, by MTBA take the Blue Line to Park St, then the Red Line to Broadway Station and bus as above. If by taxi or car, take the Ted Williams Tunnel to “D” St in South Boston. Exit left, then left onto Broadway. St George Cathedral in one-half mile on your right. Services and sermons are bilingual—English and Albanian. 9:15 AM Matins; 10:00 AM Divine Liturgy, Church School, Fellowship Hour. 10:00 AM Festal Liturgy, Dialogue Sermon. For a complete list of upcoming services, please visit the Services page on the parish website. Confessions are heard one-half hour prior to all liturgies, after evening services and by appointment. St George Cathedral was organized in March, 1908 following the first Liturgy celebrated in Boston by the Rev. Fr Fan Stylian Noli (later Metropolitan THEOPHAN). Under the omophorion of Metropolitan PLATON, it was the first parish to begin a missionary apostolate among the growing numbre of immigrants from Albanian regions who began to arrive in New England from 1886 onwards. The cathedral made a vibrant contribution to the homeland’s national awakening in the first years of the twentieth century, assisting in the formation of an Orthodox Autocephalous Church in the homeland and sponsoring the publication of liturgical books in the Albanian language for the first time. At the same time, an equally prodigious number of choral hymnals and catechetical books in English were published from the 1930’s to the present in order to meet the needs of American-born faithful served by the parish. Today, the congregation includes parishioners of many backgrounds who have embraced the Orthodox Faith. Services are conducted primarily in English and Albanian. Centrally located in near downtown Boston at the intersection of major thoroughfares, the Cathedral draws faithful from over forty outlying towns which encircle the Hub, thus giving the congregation a diverse, cosmopolitan character. It is the largest Orthodox house of worship in Massachusetts. As episcopal seat of the Albanian Archdiocese, His Beatitude, Metropolitan THEODOSIUS, Archbishop of Washington serves as administrator in his capacity as locum tenens of this diocese. On March 22, 1908, Theophan Stylian Noli celebrated the first Divine Liturgy in the Albanian language in the history of the Orthodox Church. “Our eyes were filled with tears,” Contstantine “Nini” Demo, one of our church elders would recall years later, at age 94, in relating the story of that first service at the Knights of Honor Hall in Boston. On that day, also the Sunday of Orthodoxy, the Church of St George was established and the life of our community began. Like other Albanian immigrants during those early years, who were mostly males, our founding fathers lived in konaks; dreary, unheated flats with groups of ten or more men sharing household duties and supporting their newfound church with their meager wages. 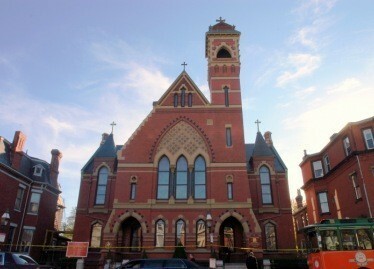 Until 1922, when the Emerald St Church in the South End was purchased, they worshipped in various rented halls and lofts throughout the city. After services, each of them would take home icons and various other holy relics for safekeeping until the next Sunday, when they would come together to literally “build the church” anew for Divine worship. Although the Albanians who came to America had long dreamed of establishing their own church, it was the notorious “Hudson incident” that rallied them to action and hastened Fan Noli’s ordination as their spiritual leader. In 1907, a young man, Kristaq Dishnica, died in Hudson, Massachusetts of influenza. No Orthodox Church would perform the funeral rites because as an Albanian patriot, he was considered an excommunicant of the faith. And so he was laid to rest in a Worcester cemetery without any religious service. The incident aroused the ire of the Albanians in Massachusetts and Fan Noli recognized his calling as an opportunity to serve the spiritual needs of his own community and to champion the cause for religious and political freedom in Albania. He was able to garner the support of Archbishop Platon, head of the Russian Orthodox Church in the Unitd States, who ordained him on March 18, 1908 at the Cathedral of St Nicholas in New York City. Just one week later, he was appointed administrator of the Albanian Orthodox Mission in America, and later elevated to the rank of Mitred Archimandrite. The founding of St George Cathedral was a pivotal event in the struggle to liberate Albania from its oppressors. Indeed, most Albanians, whether Muslim, Catholic, or Orthodox, recognized that the goal could not be accomplished without the involvement of the church. Although Albania had been under Turkish rule since 1478, its Orthodox churches were headed by the Greek Patriarchate of Constantinople. For five centuries, Albanian communications, located mostly in the south, were not permitted to worship in their own languages. It was virtually impossible to organize an independence movement in Albania because all the patriotic societies had gone underground and practically died out, on account of Turkish persecution. Although there were a few isolated patriots scattered throughout Eastern Europe and in Egypt, they felt their mission could be best accomplished through the immigrant communities in the United States. Fan Noli was selected to organize them, and in May 1906 he arrived in Jamestown, New York, where the fraternal society “Malli i Memedheut” (Longing for the Motherland) had been formed the year before. Three months later he jopurneyed to Boston to work with Sotir Peci, another great pioneer of the Albanian Renaissance, who had just begun printing the first Albanian newspaper in Boston, Kombi (The Nation). During this time, several national organizations began springing up, including the Pan-American Federation, Vatra (The Hearth), which Noli headed wioth the preeminent literary stylist and Albanian patriot, Faik Konitza. Vatra became the most powerful organization in the Albanian Renaissance, and its newspaper, Dielli (The Sun), is still published today. Noli also travelled to Bulgaria, Romania, Russia, Italy, England and France to help organize communities for the cause, all the while conducting services in Albanian. On November 28, 1912, Albania was liberated after Turkey was defeated by the Balkan Allies. But during World War I, it was overrun by foreign armies and Noli appealed to President Woodrow Wilson in Mount Vernon in July 1918 to restore its independence. He received the pledge: “I have one voice at the Parish Peace Conference and I shall use it in behalf of Albania.” Wilson’s success made him the most popular champion of Albanian independence. Two years later, as a delegate of Vatra, Noli was instrumental in gaining Albania’s admittance to the League of Nations and in securing its modern boundaries. In 1922, the goals for the formation of the Church of Albania were set forth at the Congress of Berat, but it would take another 15 years before the Patriarchate of Constantinople would finally recongize its autocephaly. In November 1923, Noli was consecrated a bishop in Korce and named Primate of all Albania. At this point, Noli had planned to retire from politics to devote all of his time to his diocese. But the following spring, he became involved in a peasant uprising against the Conservative, land owning party headed by Ahmed Zog. After a revolt he served as Premier and Acting Regent of Albania, until a few months later when Zog returned from his flight into Yugoslavia at the head of a mercenary army and reinstated his rule. Noli fled to Germany on Christmas Day, 1924, intending to return to his followers in the US, but was unable to get an American Visa and remained stranded there until 1932. Despite Noli’s absence following the war, his church in America continued to flourish and new parishes were formed in Natick, Worcester, Philadelphia, Jamestown and Southbridge. At St George’s, new clergy were ordained: Fr Naum Cere, an accomplished iconographer; Fr Damian Angeli, Fr Vangel Chamche, who later served as a bishop in the homeland, and Fr Koli Kristofer, the first Albanian to arrive in America. A choir was formed in 1916 by Professor Thomas Nassi, a New England Conservatory graduate. In the late 1920s, the women, who would come to play a major sustaining role in the life of the church, began to arrive in greater numbers, and formed their own societies, the Daughters of St George and Bashkimi (Union). In 1934, the choir was reorganized, using the hymnals prepared and translated into Albanian by Metropolitan Theophan. By this time, however, Noli faced the monumental task of translating the liturgical books and music into English to ensure the participation of the first American born generation. Ever a visionary, he also turned his attention toward the goal of uniting all the various ethnic branches of the church in the United States into a single American Orthodox Church.